Britain has made numerous mistakes over Brexit, but the European Union’s record also needs to be analysed. Tim Oliver addresses some of the things the EU has been accused of getting wrong about Brexit. In this post, he looks at how the EU has misinterpreted Brexit. Brexit has been a learning experience for all involved. British and EU negotiators have found themselves navigating their way through an unprecedented event, while academics, researchers and commentators have struggled to keep up with events, while also trying to examine the broader fallout from the 2016 vote. Mistakes were bound to be made, and there has certainly been no shortage of them, or accusations from both sides that the other is approaching the process in the wrong way. As covered in the first post in this series, some elsewhere in the EU might bristle at the suggestion the EU has made mistakes over Brexit. Surely the UK has been the guilty party here, making a series of mistakes that began with – and in some cases preceded – the vote to leave. Britain’s handling of Brexit, especially that of its government and leadership, has been far from perfect. But given the unprecedented nature of Brexit, the EU’s own approach should be critically reflected on for lessons and analysis for what it can tell us about the state of the EU. The background to Brexit itself provides a starting point to analysing the mistakes, something covered in the first post. Was the EU’s first, and perhaps biggest, mistake being too lenient or harsh on the UK as a member state? One’s view on this can define one’s views of how the EU has interpreted and responded to Brexit. Interpreting Brexit has been tough for all involved because Britain’s vote to Leave came as a shock to many, not least in the UK itself. It has provoked a mix of anger and regrets across the rest of the EU, but also hopes for both pro-Europeans and Eurosceptics. In the rush to interpret the vote, six groups of mistakes can be identified. First, Brexit shattered a taboo of contemplating the EU going into reverse. Before the vote, many in the EU – not least those committed to its advancement – shared something of a myopic vision that integration was inevitably destined to move forward, even if that was at varying speeds in different areas. Theories and discussion of European disintegration took place on the fringe, were viewed suspiciously as Eurosceptic dreams, or seen as irrelevant. That taboo helped underpin an assumption that the UK was going to stay, there being a widespread view that there was no viable alternative and that a majority of the British people would share this view. The EU’s leadership and those who debate and discuss it, failed to take the idea of Brexit as seriously as they should. As a result, the EU has learnt the hard way that like any political union it can go backwards by losing members. Second, there is often a misinterpretation of the timeframe of Brexit. Polling in several member states showed an increase in support for the EU after Britain’s vote. This can be taken as a sign the EU need not worry about Brexit triggering some form of domino effect that would lead to the unravelling of the EU. That would be to forget that Brexit is for life, not just for the two years of article 50. Britain’s position vis-à-vis the EU in a decade or further may be more interconnected to the EU, complex and weak than appears on the surface. To the publics elsewhere in the EU, however, that may appear a minor technicality if the complexities of yet another crisis such as in the Eurozone engulf the EU. Third, Brexit has been viewed through the long-standing myth that crises are what drives European integration, an idea deeply woven into the narrative of the EU. But as Desmond Dinan has shown, closer inspection reveals a somewhat tenuous link between crises and European integration. Integration has been the result of a variety of factors, with crises sometimes playing a part, but by no means being the key factor and often playing no part at all. Giving credit to crises distracts from longer-running developments and work that integration depends on. Seeing Brexit as a crisis that can only be positive for the EU risks blinding decision makers to the significance of the full scale of the current crisis facing the EU, of which Brexit is one part. Fourth, interpreting the UK vote as an anomaly. The EU’s history is replete with referendums that have seen citizens vote against the status-quo and more European integration. Britain’s vote for Leave encapsulated a whole series of concerns about the state of the UK, but the EU was anything but an easy sell. Since the UK’s vote there might have been an increase in support for the EU in other member states, but that does not mean citizens are willing to vote for further European integration. Even in the UK, as Clark, Goodwin and Whiteley showed in their comprehensive study of Brexit, a majority of Remain voters held less than positive views of the EU. While the context of every referendum is unique, Britain’s vote is not only a reminder of how unpredictable referendums can be but how difficult it is to sell the EU. As President Macron admitted in a BBC interview in January, while the context in France is different, it is possible that a similar referendum in France could result in a vote to leave the EU. 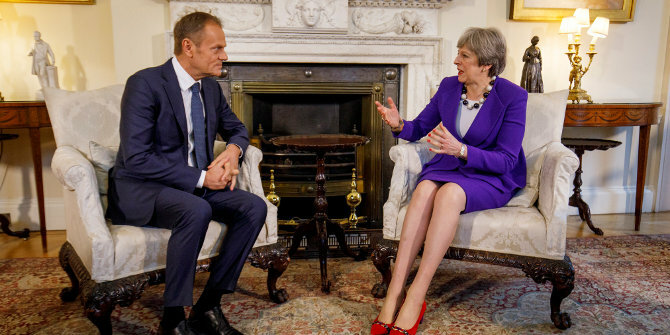 Dismissing the Brexit vote as an anomaly reflective of Britain’s history of awkwardness does little to help find a way to go about reform in the face of the continuing ‘constraining dissensus’ that faces European integration across the continent. Fifth, like the UK, the EU has struggled to interpret what Brexit should mean as a destination. The UK has excelled here, with Theresa May and her government spending the past year outlining what they don’t want Brexit to lead to (although finding unity on even this has been difficult) rather than what they do want it to mean and how to get there. This has hidden the fact that the EU itself has struggled to define what Brexit should mean because it has either put the emphasis on the UK to come up with answers or because Brexit forms part of wider and difficult questions about where the EU is headed in terms of its own development and place in Europe. Proposals such as the ‘Continental Partnership’, which tried to find an alternative to exiting models of pan-European collaboration, have been accused of arguing for the EU to change to fit a departing UK’s needs. Refusing to dance to a Brexit tune is understandable. Dismissing such proposals while offering no alternatives, however, does little to move the EU forward in facing a problem that won’t go away. Something bespoke will inevitably be created to fit the UK. Parking the UK in a soft-Brexit akin to EEA membership will work for a transition, but doesn’t define where that transition will eventually take the UK and EU. Finally, assuming it is certain that Brexit won’t happen and that Britain (or Scotland) will return as a prodigal son. It was not uncommon after the referendum to be asked by fellow Europeans whether Britain really was going to leave. There was a time when even I wondered if the UK government would go through with a full Brexit, as opposed to actively seeking a fudge or something akin to EEA membership. But Theresa May, largely without any sense of strategy, has pushed ahead nonetheless. That may well lead to the fudge of a transition where the UK gets stuck in something akin to the EEA. But with a year to go, the possibility of Brexit being stopped seems a forlorn hope that reflects a degree of denial by some. That denial is less than it was in the aftermath of the June 2016 vote, but the idea the UK is destined to re-join still has a long life ahead of it. This reflects a series of beliefs, such as that younger, Remain voting UK citizens will in time become the majority. Such thinking ignores the challenge of a UK accession, the need to win a referendum to take Britain back in, and that any pro-EU campaign would face a massive task given the underlying forces that drove the Leave vote have not disappeared and show no signs of doing so. It will take a massive economic and political shock to reverse Brexit, one that, if economic, would also hit the EU hard. There is also the belief that the Scots will jump ship to re-join the EU, although again this all too casually overlooks the massive economic, security, social, legal, diplomatic and political challenges Scotland would face in leaving a three-hundred-year union to (re-join) a more recently established one. Whether it is Scotland or the UK that is assumed to be destined to return, to some extent this is part of the assumption discussed earlier, that forward moving European integration is inevitable and cannot be resisted. Note: This article originally appeared on the Clingendael blog and LSE Brexit. The article gives the views of the author, not the position of EUROPP – European Politics and Policy or the London School of Economics. BJs threat of no-deal makes the UK in her current state unfit for membership, I am afraid. The EU27 have had enough of the never-ending Brexit opera – waiting and waiting for the fat lady to sing. As Gordon Brown analyses, the referendum result was based on inner British tensions that have little to do with the EU and nothing has been done to address them. There is no hope that any profits (or burdens) of globalization by Brexit within the UK will be distributed more evenly than the profits and burdens of globalization within the EU. The main difference will be that blaming the EU for something they cannot do anything about will abate over the generations. Wisdom may come from suffering. Quite frankly, this is tripe. I agree that there is bitter infighting within the UK, but you then go on to talk about the EU27 as if it was a cosy little group of countries united by a common purpose. Recent (since the Brexit referendum) events in Greece, Poland, Hungary, Austria, Italy and now Germany clearly demonstrate that it isn’t. It’s cosy ONLY when those countries are run by governments not prepared to step out of line with Brussels. As for bitter infighting within a member state, there’s plenty of that currently going on here in Germany and it’s getting worse by the day, so prepare yourself for some major shocks here too. It is the EU, it’s inflexibility and the intransigence of it’s undemocratic and unelected bigwigs that is causing the ever increasing levels of dissatisfaction in Europe and not your “Brexit Opera”. And just to bring you right up to date, the anti-EU, anti-mass migration Swedish Democrats, who are ready to offer the Swedes a referendum on EU membership, are now polling in first place as we head towards Sweden’s election in September. Yet another bunch of moaning, groaning Brits, I suppose? Somehow, I think not! 1. I think the bright-eyed belief in unidirectional progress died long ago. The holdouts are few and they know that they are. That said, Brexit surely makes the point clearly. In the future it may prove very helpful as a guide against overreach, too much leniency and stagnation. 2. This is why the EU stresses that long term relations will be similar to existing ones with friends and allies. There is zero appetite to risk giving the UK a deal that might turn out to be miscalculated. 3. This is just something people say to encourage themselves. It is not really a strategy. 4. The EU is a hard sell, partially because opt-outs created a complex “product ” to sell. The EU has said regularly that it relies on the member governments to “sell” membership to their voters. A central effort would not be effective, and the EU remains a small organisation (for the size of its tasks) that is not suited for this task. I can not see another solution: EU membership is up to the members to defend. 5. There are many options for the UK. Off the shelf, with small adjustments. That will suit the EU members. The CP was a strange proposal that took a contentious issue (multi-speed Europe) and proposed sth pretty universally disliked. The truth is that all of Europe is in at least one of the following treaty organisations or trying to get in: EU, EEA, custom union with EU, EEU or EACU. The EU does not need a solution for other countries, just the UK. 6. This was not an issue at the EU or in most member governments, in most cases within weeks after the referendum and certainly not after A50 was triggered. This article has some good points, but it makes the classic British mistakes. The statement that “the EU itself has struggled to define what Brexit should mean” is wrong. We know what it means. “Brexit means Brexit”. Leaving the Union means losing the benefits of membership. It’s perfectly clear, and the EU need not add to this. If the UK cannot stomach the consequence of its decision, as indeed it cannot, then it needs to ask itself if it made a mistake, or to propose an alternative that it can get others to sign up to. If the UK cannot find an alternative then, once more, that’s the UK’s problem. There will be pain for others of course, but this is akin to the pain we might feels if a valued associate moves to another country. It’s sad, but ultimately it was the other person’s decision, and we’ll get on with our lives. “Parking the UK in a soft-Brexit akin to EEA membership will work for a transition, but doesn’t define where that transition will eventually take the UK and EU.” The author speaks as if the UK were not in command of its own destiny, and as if there were parity in this relationship. The UK has “taken back control”, and it is small compared with the EU. If the finds itself “parked” on a side road, that will be its decision, and its problem. A 420M convoy is not going to be waiting to find out if a 65M bus is going to move again, or is moribund. “It will take a massive economic and political shock to reverse Brexit”. I don’t for a second think this is true. In fact all it takes is for the elite in the UK to change its mind. The population at large was previously about evenly split (only 37% voted in favour at the peak). Many did not even think the issue important. If the country started taking the issues seriously this is all that would be required (let alone some people actually changing their minds). As it is the population has been consistently showing a majority against Brexit for many months now. The project is far more fragile than this article suggests. The constant bluster from those in favour is so shrill preciously because their “prize” rests on weak, dishonest foundations. Let them have their Brexit. Let them eat that “cake”. Let them eat it, and have it, and eat it some more. Sometimes people need to a spot of indigestion in order to learn their lesson. What are these “benefits of EU membership” ? And how are they quantified? …the UK has experienced rising Euroscepticism. So the UK establishment has had 30 years to set out the claimed EU “benefits” – but ever since John Major’s nebulous “heart of Europe” narrative, has failed to quantify said “benefits”. And as for “opinion polls shifting against Brexit”….. take a look at the methodolgies of Survation and YouGov. They either discount or disregard a subset of Brexit respondents. Out in the real world, most people just want to Leave – no ifs, buts or maybes. The economic benefits of EU membership (which is the same as the costs of leaving) have been quantified in tens of studies recently (e.g. by the LSE Centre for Economic Performance). Of course every time this happens, it’s just brushed under the carpet as “biased” by Leave campaigners and ignored. The opinion polls absolutely have shifted against Brexit and that’s not tied to any one methodology. The What UK Thinks tracker has had the poll of polls average at 53% for Remain for many months now. Again, that’s simply ignored by Leave campaigners who don’t want to hear it and just regard everything they don’t like as biased. They’ll keep saying, as you’ve said, that the anecdotal evidence of people they speak to says otherwise, as if that’s a legitimate argument, which of course it isn’t. In short, all of the evidence is there for anyone who actually wants to see it, but it simply won’t be acknowledged by those who have a dog in the fight. What else is new. I gave up long ago trying to get such people to change their minds, it’s just a waste of time. Brexit is not about the 52% but about whether British banks (and the Russian capital managed there) will be subject to EU control or not. The driving forces are Murdoch and Putin and their proxies Rees Mogg and Boris Johnson. They have led the 52% up the garden path to vote Brexit before it was defined. Do you seriously believe that they will give up peacefully under any circumstances?